For Air Force personnel on the go, the Belleville 612 Z boot adds a convenient side zipper that won't slow you down. This boot features Belleville's Meramax lightweight midsole, a weight-saving design that doesn't sacrifice any comfort and reduces shock on your knees and ankles. You'll be thanking to Belleville engineers that you'll be thankful for at the end of long duty shifts. This boot is unlined for hot weather and has dual instep air vents to promote airflow and keep your feet dry and cool in hot dusty conditions. For speed and convenience, a side zipper provides easy wear and removal of your boots, ideal for Airmen that have to put on and remove their boots often. A heavily padded tongue and collar adds additional comfort. 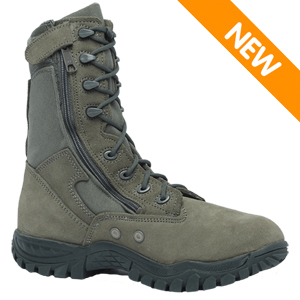 It's also one of the lighter full size tactical style boots on the market - and thanks to the unique running shoe design, it's also one of the most comfortable. Best of all, it's Air Force ABU approved and proudly made in the USA.